It was somewhat inevitable that we would one day see a turbocharged mid-engined Ferrari, and that day has come in the form of the new 488 GTB model that will debut at March’s Geneva motor show. 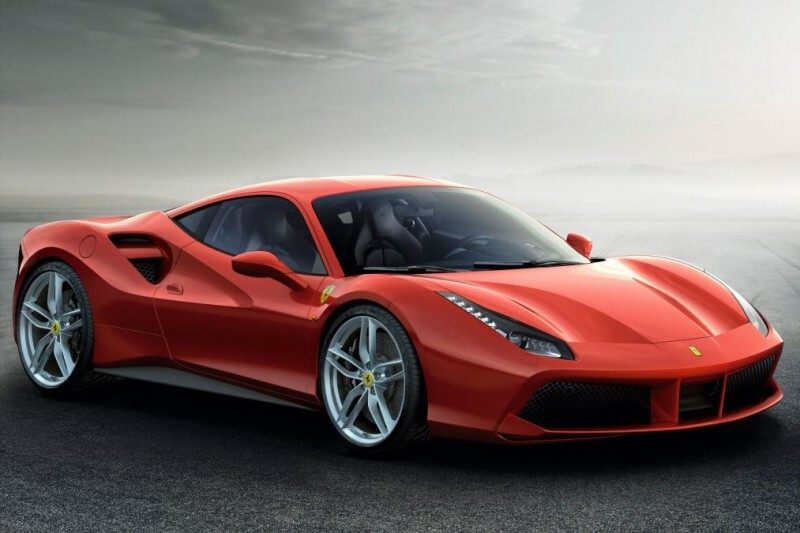 Replacing the now five-year old 458, the 488 GTB will be launched 40 years since the first mid-engined Ferrari – the 308 GTB – first broke onto the scene and will hunt down the McLaren 650S with a new engine and improved aerodynamics. 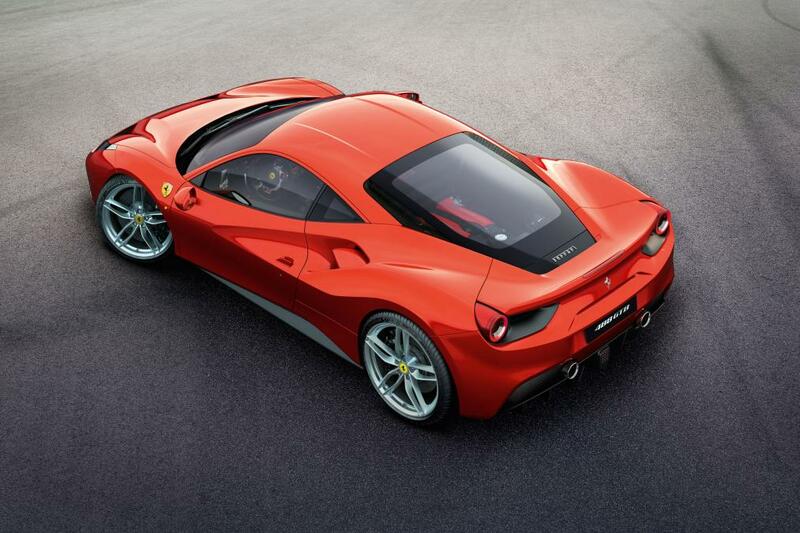 Behind the two seats of the 488 GTB sits a 3.9-litre twin-turbo V8 that has its 661bhp go through the latest of Ferrari’s seven-speed dual-clutch transmission to get much closer to the McLaren’s output. Meanwhile, that forced induction sees torque levels rise by 220Nm to a whopping 760Nm, resulting in a 0-62mph time of 3.0sec dead to match the 458 Speciale. On Ferrari’s Fiorano test track in Maranello, the 488 GTB will complete a lap in just 1min 23sec, two seconds faster than the car it replaces and half a second quicker than the Speciale, which might make some customers of the latter a bit miffed. Although, we’re sure they’ve probably got their 488 order in already. Cues from the LaFerrari hypercar can be found all around the 488 GTB, especially in the front splitter area and headlights, but also the side ducts on and behind the doors. The rear, though, is very Speciale thanks to those twin exhausts and a very similar layout for the taillights and diffuser, resulting in 50 per cent more downforce and reduced drag over the standard 458. 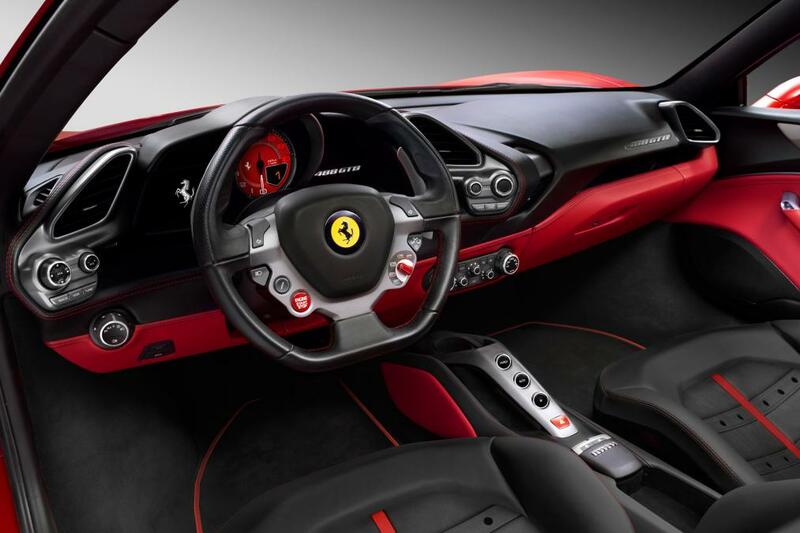 Step into the cabin and you’ll find a very typical, high-quality Ferrari interior, with the usual multi-function steering wheel and a driver-focused dash. The 488 GTB’s electronics are also synonymous with the Italian manufacturer, with Ferrari giving the sports car a more advanced version of its Side Slip Angle Control system (SSC2) for extra finesse during drifts, while the car’s F1-trac stability control and E-Diff will help you drive like a demon. Some may worry about the classic Ferrari V8 howl disappearing with the inclusion of turbos, but while it will be a different aural experience, Ferrari insists it has created a “new soundtrack that is full, clear and totally distinctive”. Those few worried about getting the best mileage out of their Ferrari 488 GTB will be glad to know the new engine means economy is up to about 25mpg and emits just 260g/km of CO2 – that’s a single more mile to the gallon and 15 less CO2s than the 458. The Ferrari 488 GTB is another car we can’t wait to see in the flesh at Geneva, while the car will go on sale later this year for a price some way in excess of the 458’s £178,000 tag.